Moon watchers in the western U.S., Hawaii and elsewhere across the globe were treated Saturday to a rare celestial phenomenon: a total lunar eclipse. SAN FRANCISCO (AP) — Moon watchers in the western U.S., Hawaii and elsewhere across the globe were treated Saturday to a rare celestial phenomenon: a total lunar eclipse. 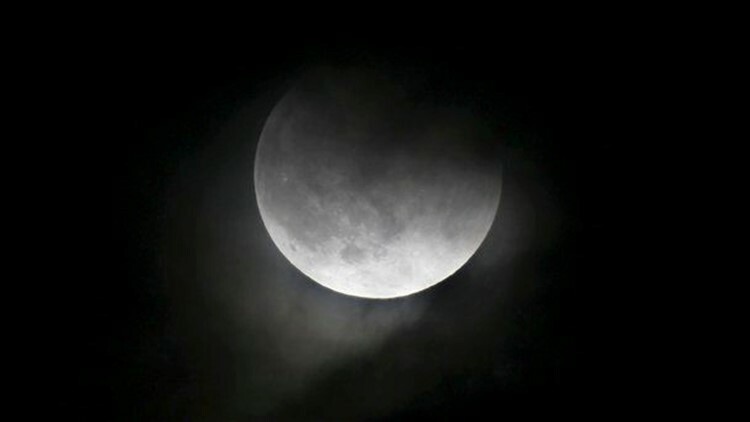 For 51 minutes starting at 6:06 a.m. PST, the Earth's shadow completely blocked the moon. The moon took on a reddish glow, as some indirect sunlight continued to reach it after passing through the Earth's atmosphere. Since the atmosphere scatters blue light, only red light strikes the moon, giving it a crimson hue. David Sayre, who runs a public relations firm in Hawaii, said it had been cloudy and rainy around his house on Oahu, but the weather cleared just in time for the eclipse. He awoke, as he usually does, around 3 a.m. and remembered to step outside the house in time to catch the eclipse about a half hour later. No one else in the neighborhood was up. "Sure enough it was turning that orangy-red color," Sayre, 47, said. "I said, 'Gosh I better grab a camera.'" He added, "To be able to see it just right outside our house was really cool." At the Griffith Observatory in Los Angeles, some 300 people, many clutching coffee cups in the frigid morning air, sat with blankets and chairs on the observatory's great lawn. Perched on a slope north of downtown near the Hollywood sign, the property offers clear views of the sky. Observatory officials alerted the crowd when the eclipse began and spontaneous applause erupted when the celestial event ended. "It's really exciting to be out here. It's really just a beautiful image...," Alex Padron, part of an amateur astronomy group, told KTLA-TV. A total lunar eclipse occurs when the moon goes through the long shadow cast by the Earth and is blocked from the sunlight that illuminates it. The last total lunar eclipse was on June 15 although that was not visible from the U.S. The next one is on April 15, 2014, and will be seen in the U.S.
Associated Press writer Chris Weber In Los Angeles contributed to this report.